Every dollar you raise benefits those affected by Alzheimer&apos;s disease in your community. 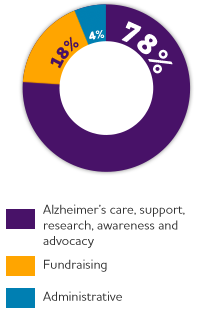 The Alzheimer&apos;s Association is a global organization, working to advance care, support and research across the world. From face-to-face support to online education programs and promising worldwide research initiatives, the money you raise makes a difference in the lives of those facing Alzheimer&apos;s.
The Alzheimer&apos;s Association exceeds the rigorous standards of America&apos;s most experienced charity evaluator, the Better Business Bureau Wise Giving Alliance. The Association also holds a National Charity Seal from the Alliance. Provides care and support to all those facing Alzheimer&apos;s.
Brings the global research community together to tackle common challenges, such as the first new diagnostic guidelines for Alzheimer&apos;s in 27 years. Drives support for transformational projects such as the Dominantly Inherited Alzheimer Network Trials Unit (DIAN-TU). Speaks up for the needs and rights of people affected by Alzheimer&apos;s.
Recruits and trains hundreds of thousands of advocates to ensure that Alzheimer&apos;s disease cannot be ignored.